A Soyuz spacecraft carrying a veteran Russian cosmonaut, a U.S. test pilot-astronaut and a German volcanologist rocketed into orbit Wednesday and chased down the International Space Station, gliding to a picture-perfect docking to boost the lab's crew back to six. With commander Maxim Suraev at the controls, the Soyuz TMA-13M spacecraft's forward docking mechanism engaged its counterpart on the station's Earth-facing Rassvet module at 9:44 p.m. EDT (GMT-4), five hours and 47 minutes after liftoff from the Baikonur Cosmodrome in Kazakhstan. "Contact and capture confirmed," reported Dan Huot, NASA's mission control commentator in Houston, as the two spacecraft came together 260 miles above the Pacific Ocean approaching the northwest coast of South America. 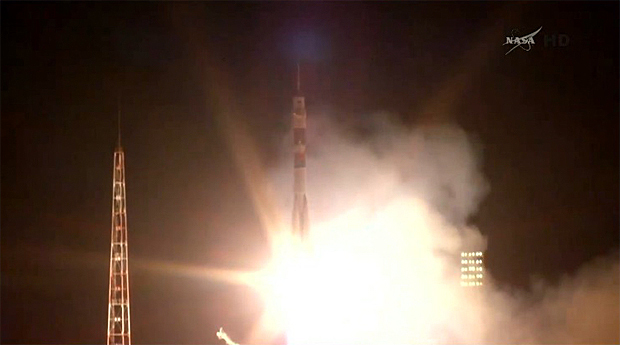 "Congratulations," a Russian flight controller radioed a few moments after docking. "We're wishing you good work and wishing you safe operations." "OK, thank you very much," Suraev replied. "We're going to do our best, we'll do everything we can." Following extensive leak checks, Suraev and his crewmates -- flight engineer Reid Wiseman and European Space Agency astronaut Alexander Gerst -- opened the capsule's forward hatch at 10:52 p.m. and floated into the space station, greeted by Expedition 40 commander Steven Swanson, Alexander Skvortsov and Oleg Artemyev. During a video chat with dignitaries and family members gathered at Baikonur, one of Wiseman's two young daughters asked "how was your launch?" "Hey, it's awesome to hear (you)," Wiseman replied. "The launch was absolutely crazy! And seeing the Earth for the first time was totally insane! It's hard to process all the information that's going on. But we're up here now with friends, and everything is very floaty." His other daughter asked about the crew's mascot, a small stuffed animal known as Jirafetti. "Jirafetti is doing great," Wiseman said. "I don't know if you guys had video right when we started, but Jirafetti is here with me, he took the journey very well, and he's enjoying space." After the video conference, Swanson planned to conduct a safety briefing to bring the new crew members up to speed on station systems and emergency procedures before all six fliers took a break to close out a long day. The mission began with a sky-lighting burst of fire as the Soyuz rocket's first-stage engines roared to life at 3:57 p.m., quickly pushing the spacecraft away from the firing stand, the same launch pad used by Yuri Gagarin at the dawn of the space age. Suraev monitored the automated ascent from the command module's center seat, flanked on his left by Wiseman, a veteran Navy carrier pilot making his first spaceflight, and on the right by fellow rookie Gerst, a European Space Agency astronaut with a doctorate in geophysics. 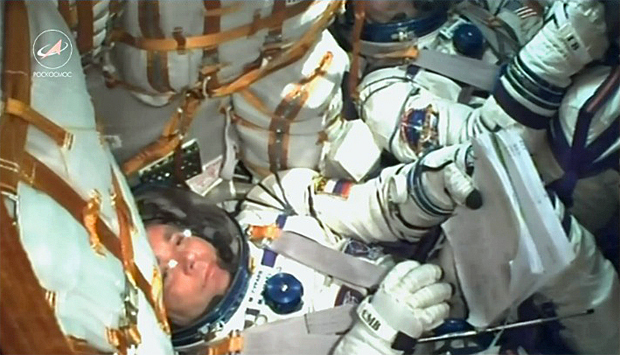 The climb out through a starry sky went smoothly and all three crew members appeared relaxed and in good spirits as they monitored cockpit displays, flashing smiles and thumbs up gestures on downlinked television. Four minutes after liftoff, the 150-foot-tall rocket's four liquid-fueled strap-on first-stage boosters shut down and fell away, followed three minutes later by separation of the central second stage core booster. The rocket's third stage then ignited to continue the drive to space. The third stage shut down as planned eight minutes and 45 seconds after launch. Moments later, the Soyuz TMA-13M spacecraft was released to fly on its own and the capsule's solar arrays and antennas deployed as planned to complete the initial launch phase of the mission. Asked what he looked forward to the most in his first spaceflight, Wiseman said "floating, the view, and the chance to do some science that maybe not now, but maybe 10 of 15 years down the road helps save somebody's life." "If we can something like that, then my time is well spent," he said in a pre-flight interview. "But the first thing I want to do when I get there, I've got to give Swanny a big hug, and then it's time to go look out the window." The launching came amid increasing tension between the United States and Russia in the wake of the ongoing crisis in Ukraine, retaliatory U.S. sanctions and subsequent threats by a senior Russian leader to restrict the use of Russian rocket engines in American Atlas 5 boosters used to launch U.S. military satellites. Dmitri Rogozin, Russian deputy prime minister for space and defense, has also threatened to pull out of the station project in 2020, well before NASA's goal of operating the outpost at least through 2024. For their part, Suraev, Wiseman and Gerst said preparations for the Soyuz TMA-13M flight were routine and that the Cold War-era rhetoric in the wake of the Ukraine crisis had no impact on day-to-day space station operations. "Our team, our crew is not just a team of three different guys from three different nationalities or continents," Gerst said at a pre-launch news conference. "We're actually a group of friends." Along with two years of intense training "we've spent weekends together, we've spent weekends on Max's dacha, we've spent weekends together in Cologne, our families know each other really well," he said. "Space is without borders. We fly to an International Space Station where we do experiments that come back to Earth, that benefit all of us, all humankind." The crew answered another question about international relations by standing and embracing, prompting cheers and applause. 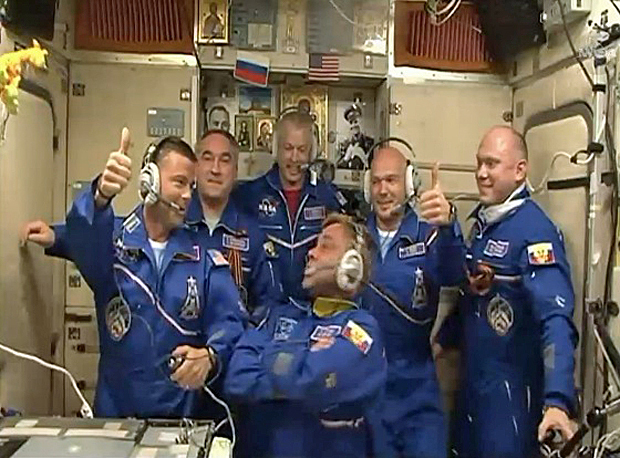 Suraev then posed with his crewmates for a "selfie" to another round of cheers. "When it gets right down to it, we're still supporting each other," NASA space station Program Manager Michael Suffredini told CBS News in a recent interview. "We talk at my level, we're talking at (headquarters) level, we regularly have telecons to reaffirm our commitment. Every time we do something together the teams work and support each other the way we always have. "We're trying really hard to do what both of our government's have essentially told us to do (and) that is to continue working in spaceflight the way we have." The combined Expedition 40 crew faces a busy summer with two Russian spacewalks on tap, up to three U.S. EVAs, the arrival of a Russian Progress supply ship, a final European ATV cargo carrier and two U.S. spacecraft: an Orbital Sciences Cygnus supply craft and a SpaceX Dragon capsule. "Our key challenges for this increment will be managing the slew of vehicle traffic that we have in addition to the EVAs that are planned and of course, we also have a very ambitious utilization schedule as well on top of that," said lead Flight Director Greg Whitney. "So it's going to be a challenging time for both the ground and the on-board crew, but we're looking forward to it. It'll be a great mission." Wiseman said he was particularly interested in medical research using the crew as test subjects. "We have a ton of human research planned," he said. "They're going to look at my blood, my skin, my bones, my muscle, my eyes especially. And I'm really looking forward to getting into all that science. All that stuff fascinates me. As a Navy pilot, I always had an aversion to medicine. Now I'm being forced into it and I absolutely love it!"